"Kerascoet Cottage" photo by Nathalie: http://www.flickr.com/photos/natamagat/3423748226/in/set-72157616500095496/. Some Rights Reserved. 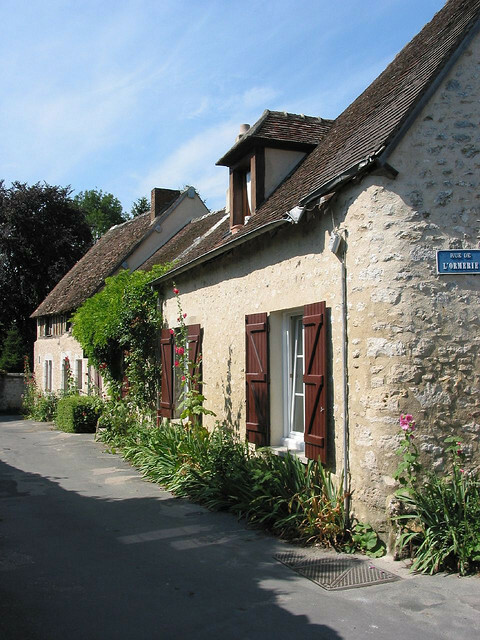 I adore this French cottage. 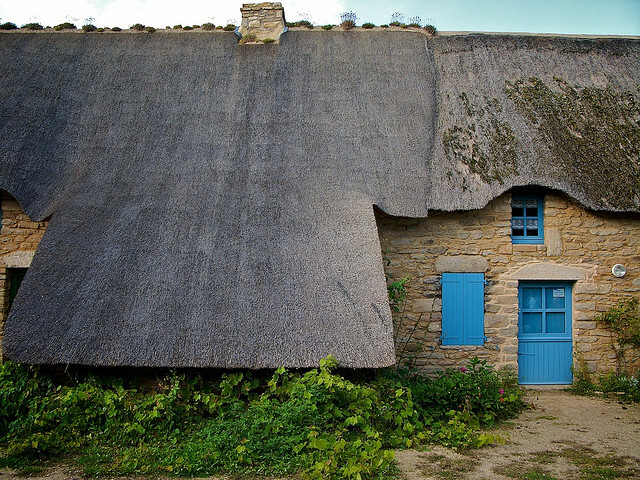 The thatched roof and the blue shutters set against the gray stone are so pretty. The little window box almost gets lost in the abundance of glorious flowers surrounding it. Ce gîte est magnifique! But let's not stop here. 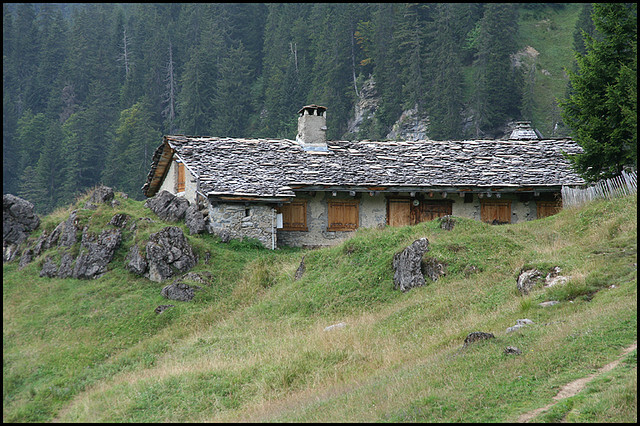 Join me for more French cottage love. "Cottage Creeper" photo by Xerones: http://www.flickr.com/photos/xerones/1303708243/. 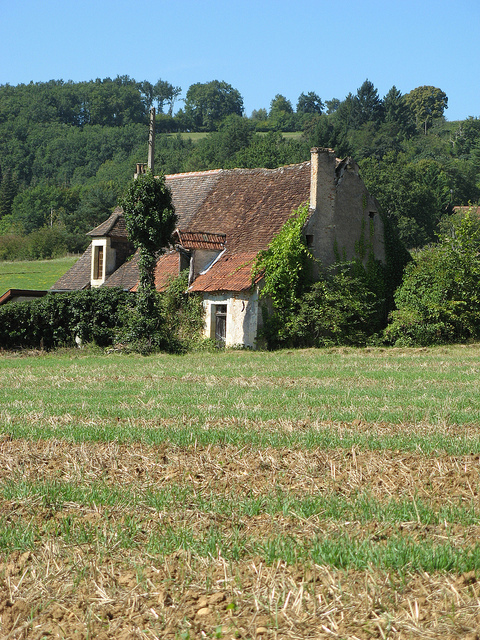 Creeper has nearly taken over this cottage in Pierrerue. "Summer Cottage" photo by Eric Allix Rogers: http://www.flickr.com/photos/reallyboring/6268377928/. 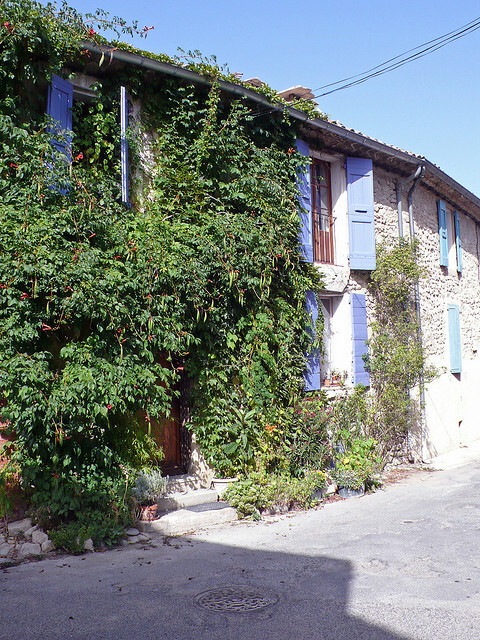 A summer cottage in Provence-Alpes-Cote d'Azur. Pas rustique? "Postcards from Brittany 22 - Cottage" photo by Michael Foley Photography: http://www.flickr.com/photos/michaelfoleyphotography/2897248412/. Some Rights Reserved. 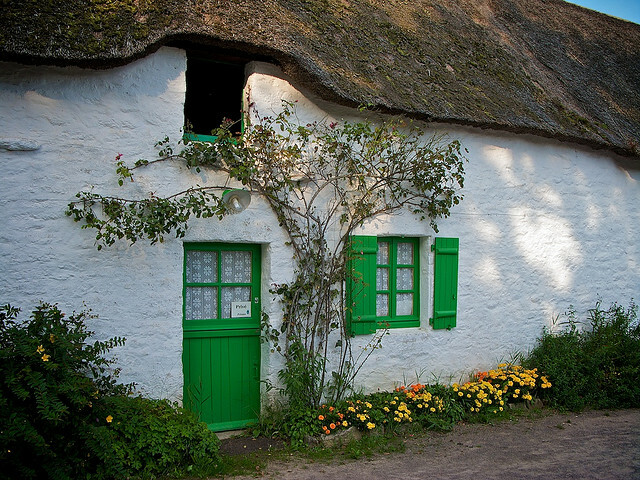 This thatched cottage of La Brière marsh shows off a cheery green door and window. If I didn't tell you it's in France, would you think it to be an Irish cottage? 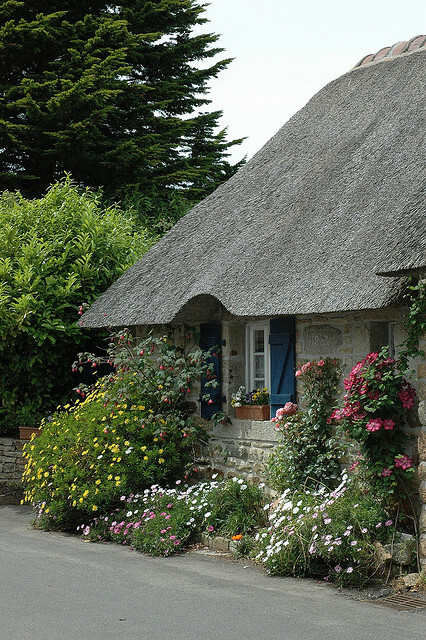 Beautiful Brittany thatched roof cottage. So much charm. I've never seen a thatched roof cottage like this one. Stunning. "DSC_9663c/Cabanon de provence avec son moulin à vent" photo by Koen: http://www.flickr.com/photos/koen_photos/4622245256/. 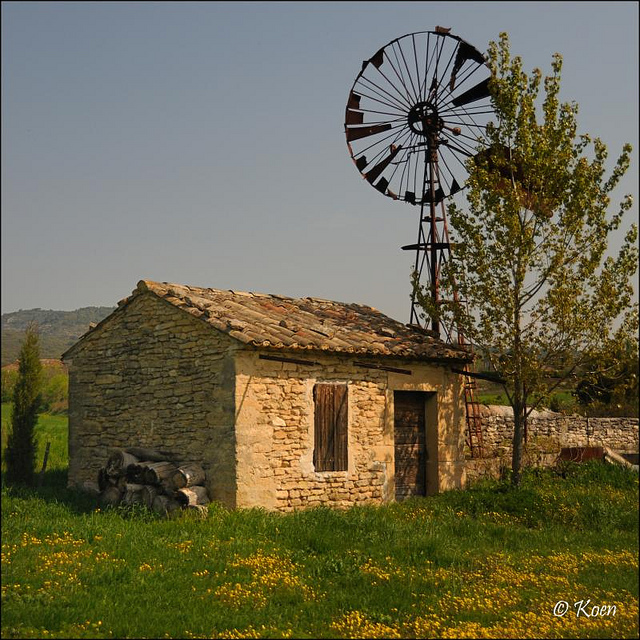 "Cabanon de provence avec son moulin à vent" translates to "Cottage of Provence with its windmill." In cottage language it translates to very picturesque. "Cottage Exterior 1" photo by Lisa Larsson:http://www.flickr.com/photos/ljcybergal/1047370639/in/set-72157601299754053/. Some Rights Reserved. 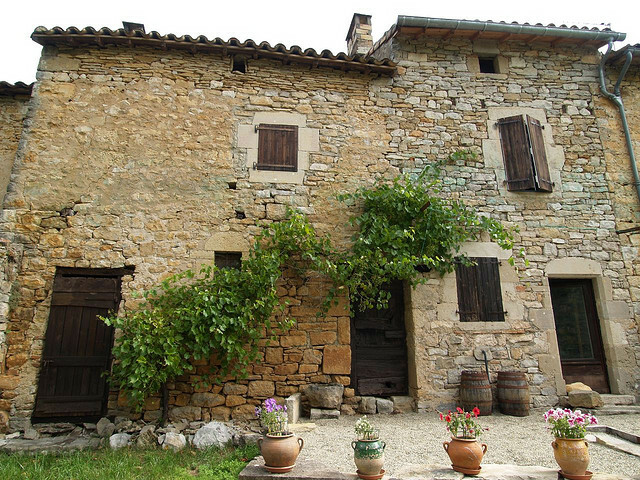 I admire the rustic simplicity of this Midi-Pyrenees cottage. "IMG_5139" photo by Andrew Batram: http://www.flickr.com/photos/andrewbatram/6085337287/. An enchanting cottage in North Burgundy. The little window with the flower pot is so sweet. Beautiful flowers flow like a waterfall on the stone wall. 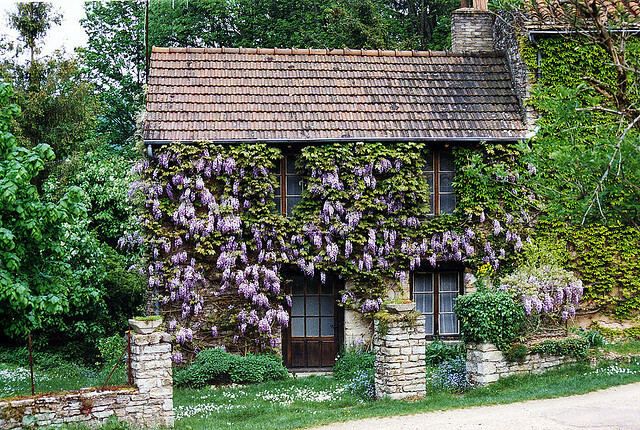 I believe that's wisteria covering this Burgundy cottage. How long would it take to grow this mass of gorgeous blooms? "Provins0006" photo by Becky Bielstein: http://www.flickr.com/photos/beckybiel/65011796/. This is nothing short of wonderful. The chocolate brown shutters are perfect for this cottage. "Cottage" photo by Ben Salter:http://www.flickr.com/photos/ben_salter/1304976132/in/set-72157600218817212/ . 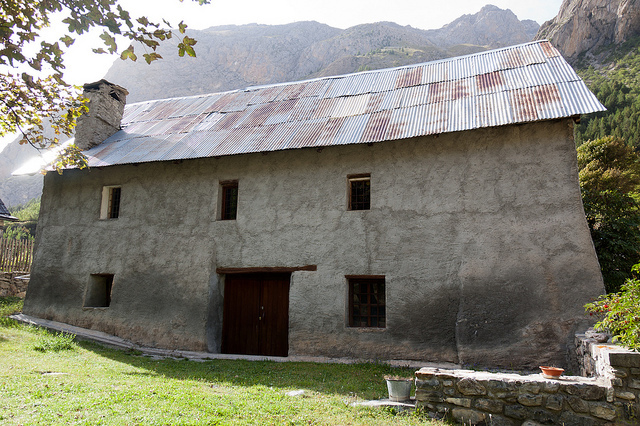 a completely different cottage style in the French Alps and equally charming. So, were you able to choose a favorite cottage? Rustic, or refined? Thatched roof or tiled, metal, or shingled? Botanically unadorned, or glorious with flowers? I'd love to hear what you think. Until next time, Adieu mes amis. Let's just say I wouldn't turn down any one that was offered to me, Jeanetteann. :) Thanks for stopping by and commenting. Have a great week. I can't choose either. Just love them all. So beautiful! Thank you Nancy. In the midst of a grey wet Kentucky winter, I took a colorful vacation in my mind! I needed that. Renee, I posted just in time then. Hope sunny skies push the grey away soon. God bless. Dreamy! LOVE them all. Thankd for sharing. My pleasure, Debbie. 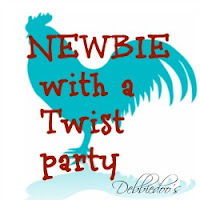 Thanks for hosting Newbies, and for taking the time to drop in and comment. Cheers. They are all wonderful. But I did pick two favorites and they are very different. I love the first one with all the flowers and then the cottage with the windmill. Ah, you chose well, Grasshopper. :) Have a great week, Barb! Flowers and thatched roofs do it for me every time, Nancy. Hope your week is filled with blessings. 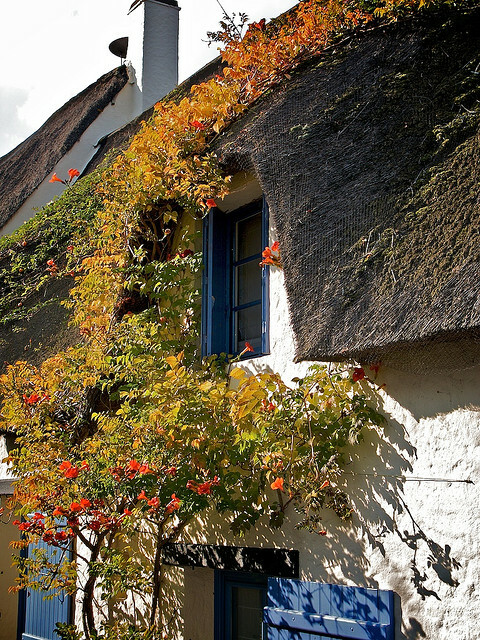 They are all lovely, but the thatched roof cottages with blue trim...heavenly! I have to admit I'm partial to the cottages with the blue trim in this collection. Nice of you to visit, Kim. Enjoy your week. 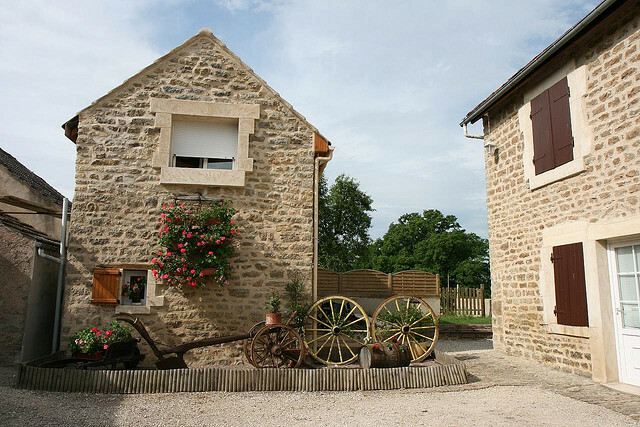 I'm torn between the North Burgundy one with that wonderful brown stone and the one with the gorgeous French blue shutters. I want a soft sweater in that color. Now, I love odd roof lines, I mean love them, but that one that goes almost to the ground in front, a little odd. I wonder what the purpose in that was? The French blue shutters are charming, Dewena. Love the color. The low thatched roof is, indeed, odd. I'm wondering if it serves to shelter a patio. If not, I'm stumped. Wowee! These are all SO beautiful! I love the blue and green trim on some of them. Fantastic! Me, too, Jori. The colors really work. Enjoy your day! Nancy, I so enjoyed these French cottages. Love, love that overflowing window box and that Wisteria, oh my! I think so, too. Thanks for stopping by.